The first boy I ever loved was a Catholic School Bad Boy with a mischievous grin. It was the kind of love that tasted like cherry ChapStick and smelled like clean boy sweat. Not gym bag “my socks have been germinating in here for six months” teen boy but pure and undiluted burgeoning maleness. I used to turn my nose into his neck, his chest just to breathe deeply the intoxicating mixture of exertion and flooding pheromones, that special smell of him. It was the kind of love you can only have when you’re 15, all-consuming and heart-wrenching. The Romeo and Juliet Syndrome of feeling someone’s touch so intensely it devours you, fiery and fast, and I was Patient Zero. He would pedal his BMX the long country mile to my door and we would make out on a pile of stuffed animals (because the bed made too much noise to bring my parents running), a sewed on button nose digging into my back as we became tangled limbs and gasping breaths. Kissing until our lips were chapped and needed cherry ChapStick. Then we would lie on the faded purple carpet of my bedroom floor doing nothing more than listening to music, me listening to his heartbeat under my cheek as I pressed against him, a finger tracing down the bare unbroken skin of his forearm in the spot where he would ink an anarchy symbol in a few short years. Here is where I learned to revel in the stillness of just being. Of just this moment. I was the straight-A Good Girl, all pent up and closed in, when we met. He was my window to something freer within me. He was a “Come for a ride in this ‘borrowed’ car” kind of Bad Boy. Which I will neither confirm nor deny occurred. Perhaps cliché, the Good Girl/Bad Boy teen duo but clichés exist for a reason. He was more than just the Bad Boy though—he was the golden unicorn of teen girl desire, or at least my unicorn – the Bad Boy with a Good Heart. He’s the reason there’s still a tiny teenage part of me on the lookout for another unicorn: a tattooed, misunderstood bad boy with a good heart (even though cynical adult me knows waaaay better—adult bad boys are just that, bad for me. Someday I’ll learn.). He loved me at the age when teenage girls often don’t know how to love themselves and I was no exception. In fact, being the constant overachiever, I even gold-starred my self-destructive coping mechanisms. He touched my body eagerly when I was struggling with gaining back healthy weight from starving myself to 85 pounds. When I was so far removed from loving my own body he showed me it was desirable. He kissed me gently at a time when I used the sharp edges of kitchen knives and razor blades on my outsides so I wouldn’t feel the sharp edges on my insides. Wrapped in his arms, tucked in the nook of his shoulder, I was able to fall to pieces and stitch myself back together a little. He loved me before I knew how to be strong and broken at the same time, when I thought all I was was broken. Before I knew we are all broken in some way and that is what makes us beautiful. Like most first, young loves the fire burned pure and bright and quickly. When you’re that young you don’t know how to tend it, how much work it takes to stoke love indefinitely. That real, enduring love is the hardest of toil. But, of course, when you’re 15 and 16 years old, seven months seems like an eternity to be together. So when my first love became my first true heartbreak it was crushing. He wasn’t my first boyfriend nor my first break up but it was the first time I was so emotionally invested in another that I thought I could actually hear the smashing shards inside me as we sat at that picnic table in the June night air and he said it was over. Maybe it’s just the memory of the cicadas. 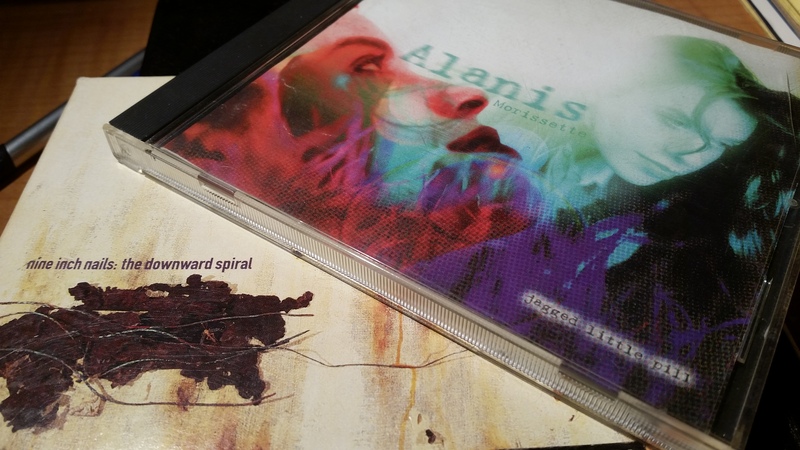 The aftermath is hazy after 20 years but I recall a lot of angsty poetry being written while Nine Inch Nails Downward Spiral played on a loop and a fair amount of muttering to myself while listening to the ultimate angry chick album of the early 90’s Jagged Little Pill. Yes. I am 35. In case there was any question, allow me to date myself via my musical references. Jagged Little Pill is still my angry cleaning the toilet music. But life moved on. We moved on. We became adults who outgrew Romeo and Juliet Syndrome like babies outgrow croup. Over the years my Catholic School Bad Boy and I drifted apart and together more than once, crossing paths and keeping tabs. Now he’s married with 3 kids, the anarchy tattoo covered up by something less … antagonistic. He’s a stay at home dad who has found his adult, enduring love worth the work in his wife and family. And I am thankful. Thankful he was my first love. For bringing out my wild streak. For loving me when I was too young and unsure to know how to love myself properly. I am grateful for my first lessons in swimmable moments, to be in the here and now. I am thankful to him for pioneering my weakness for mischievous grins. 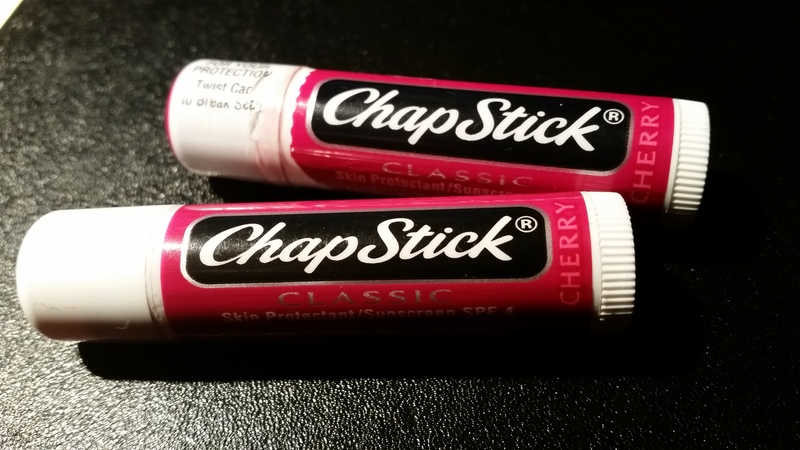 And for cherry ChapStick. This is a really good post. Wow. You write exceptionally well. Not a topic I would think I’d like but the way it’s written gives it so much weight and power. Truly. Good read. Thank you so much! That is incredibly kind of you. Oh. You are very, very good. I am now off to wallow in the wordy wonderland that is your blog. If you don’t hear from me in the next hour, call for back up. Thank you. I shall immediately be stealing the phrase “Wordy Wonderland” and begin designing my theme park full of rides like Tilt-A-Quill. Hope you enjoy the rest of the spilled milk of my mind. I’m taking a screen shot of this conversation for future legal proceedings. Have a good night. Ive read this a handfull of times now. The references to music is powerfull. Its not an overt, stop what im doing and reminisce type reaction, but whenever Silverchair randomly plays on the radio, i always listen, it makes me smile. Always will. beautifully written… simply divine. I am getting addicted to your words.. Thank you so much! Words are a powerful addiction of mine so I’m happy to share the habit.